The Cuisinart TOA-60 is one of the most popular toaster ovens around today. When I found this out I simply couldn’t resist getting one for myself to test. Honestly, I wasn’t expecting much but wow, was I wrong! In my detailed review of the Cuisinart TOA-60 convection toaster oven & air fryer I’ll explain what you need to know before buying. You’ll also find out what it’s like to own one and why if you don’t have one, you’re missing out. Keeping reading to find out how what happened when I cooked several popular foods – and the surprising things I learned. I’ll also address some common complaints I’ve found from other owners. You can also jump to the review score and pros/cons list now if you like. Cuisinart is one of the largest manufacturers of toaster ovens and other home appliances today. The TOA-60 (circled above) is a specialty model with more features than many lower-priced competitors sold. Cuisinart is known for some excellent-performing, affordable ovens many buyers love. The Cuisinart TOA-60 is one of the many toaster ovens you’ll find on the market, and one of many different types the company manufacturers. Additionally, the company produces a number of other appliances for the kitchen too. However, while it is indeed primarily a toaster oven, the styling and oven features are where the similarities end. The TOA-60 is designed in a nice stainless steel body. One more thing that sets it apart (and that I really became fond of) is the top-mounted controls. 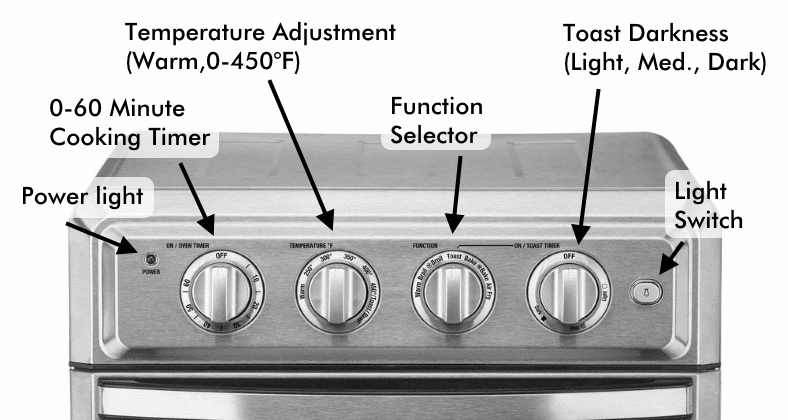 Whereas most toaster ovens have them on the side, the TOA-60’s controls are located on the top front. This means it takes up less horizontal counter top space. I picked up my Cuisinart oven which was well-packaged and easy to carry. Convenient carry handles (one on each side) come with plastic inserts which make them easy on the hands. Inside is eco-friendly recycled cardboard packaging. 2 of the 3 included cooking trays (along with the manuals) stored on top. The third tray can be found in the bottom. You can tell a lot from unboxing a product, I’ve learned. It speaks a lot for what kind of quality and thought that has (or hasn’t) been put into a brand’s manufacturing. Picking up the TOA-60 was a breeze! While it is a bit bulky (after all, it’s one of the larger toaster ovens out there) it was actually easier to carry to my car than expected. Located on each side is a handy carrying handle with a plastic insert for ease of use. It makes picking up the box without tearing so simple and is nice little touch. I was excited to get started testing my Cuisinart right away. 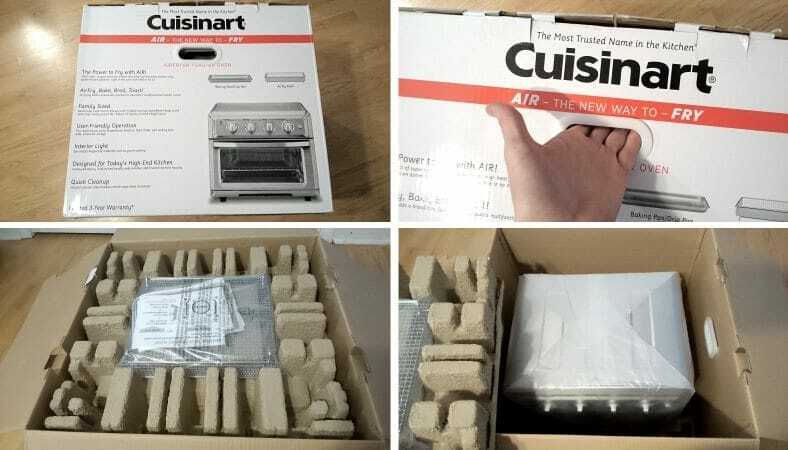 Inside was well-designed recycled cardboard packaging that not only keeps the oven secure in shipping but also holds the included cooking trays and owner’s booklets. They’re well-made and fit well into the oven, with the air fryer basket having 4 feet which allows it to rest on top of the baking tray to serve as a drip catcher. Included are 3 booklets: 1) A quick-start cooking guide for the oven, 2) the owner’s manual & recipe booklet, and 3) and easy-warranty registration insert. Included are 3 great-looking types of documentation: A quick-start guide, a more thorough owner’s manual, and a cool little insert which allows you to register you oven’s serial number online by using a phone picture. That’s a really nice little feature I haven’t seen before. Additionally, I noticed the owner’s manual includes lots of great recipes of all kinds to get the most enjoyment out of your new oven. Very nice! 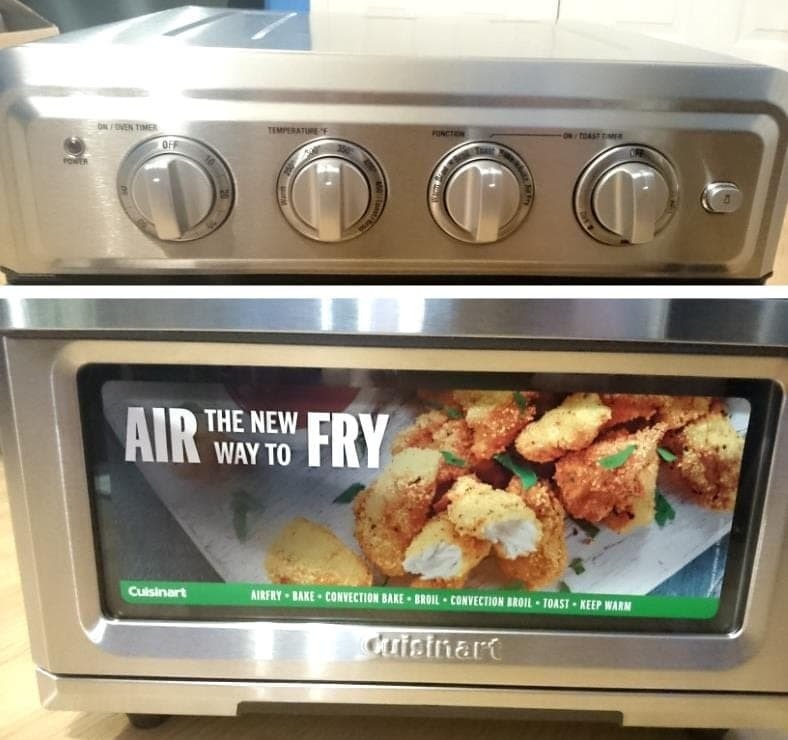 I have to say I was impressed – especially with the quick start guide which helped me get the oven set up quickly and ready for cooking right away. So far, so good. But what about the build quality? I’m not one to skimp giving products I review the “once over”, as it’s important to look for build defects, manufacturing problems, and other potential issues. Build quality, fit and finish, and assembly are great! I’m very pleased to say it’s well put-together, and I found no quality issues whatsoever. The controls are tight, turn well, and are clearly marked with black printed labels, with a power-on indicator located to the left of them. During manufacturing a static-cling display label is placed on the oven door window, so you’ll need to peel it off before use, of course. The TOA-60 has a great stainless steel body I really like. While the unit sells for only around $200 or so, it looks quite nice and professional – much like it was much more expensive! High-temperature black plastic finger holds are located on the base (both sides) for easy moving. There’s also a power cord wrap feature, too. What I love about the TOA-60 is not just how great looks but how well great the stainless steel construction is. Cleanup of the outside is easy (using a damp cloth or gentle scrubber to avoid abrasives) when needed. Located on the bottom of each side is a recessed area under which your fingers can be placed for easy carrying. Additionally, there’s a cable wrap for the power cord on the rear as well. Checking out the oven, I have to say I found the build quality to be great. Note also that non-scratch feet are located underneath, so it’s safe for expensive counter tops too. The TOA-60’s oven interior features a pretty roomy size with lots of room for cooking most personal meals including a whole chicken. 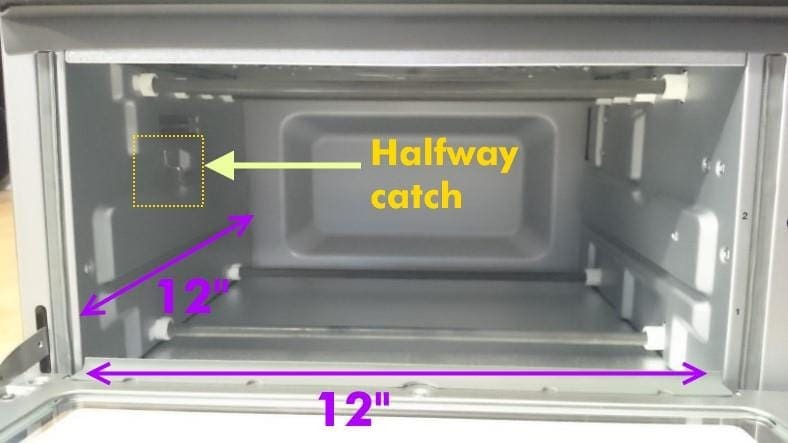 I measured the interior oven size at about 12 x 12.” On the left-hand side the oven features a “halfway catch” which allows pulling the oven rack or baking tray out 1/2 way and leave it there hands-free. It also serves to help keep you from accidentally sliding and dropping the rack. The left-hand side of the oven features a catch which prevents the oven rack or baking tray sliding out accidentally. 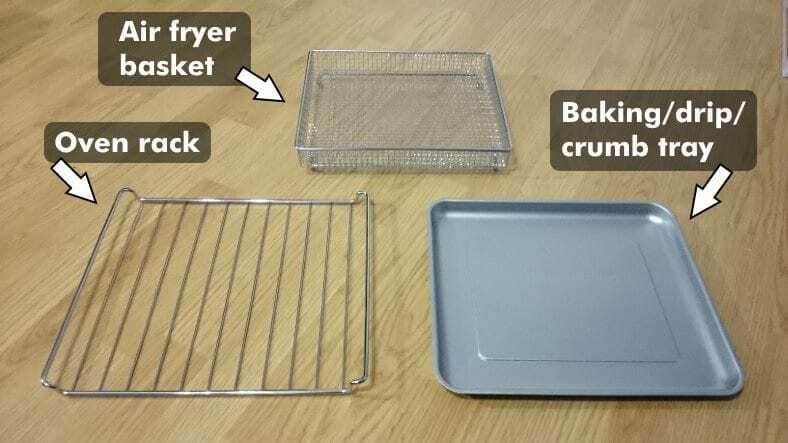 It’s also useful for holding the baking tray or oven rack halfway out when loading or unloading food. While it is a scaled-down version of a traditional larger oven, it features the same convection oven cooking as ovens sold for $600 and above…just with less space inside. Personally, it’s a nice little touch I think. In order to use remove or install cooking trays I had to lean them in at about a 45 degree angle to slide underneath the catch. 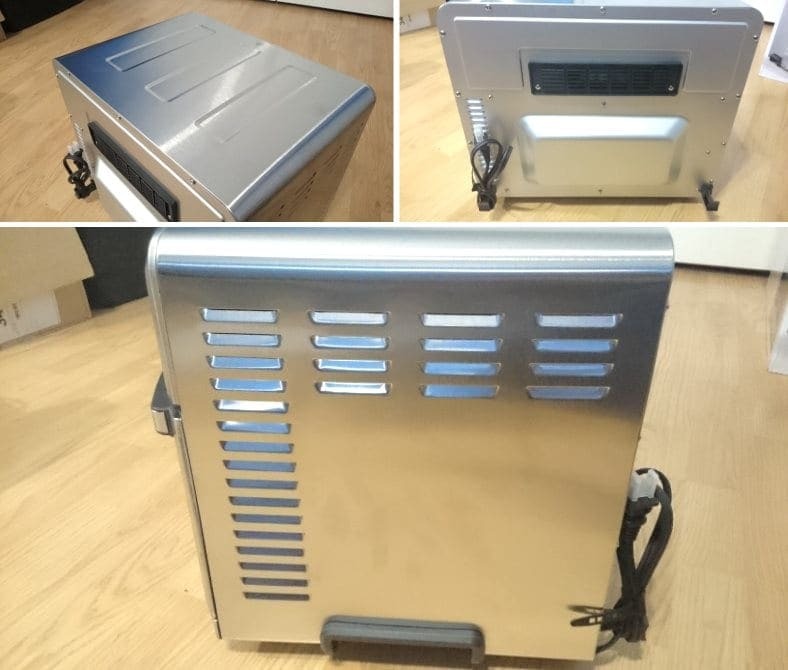 The oven also features 6 300W heating elements for a total of 1,800W of power. There are 2 on the bottom while the remaining 4 are at the top. Note: It’s critical to use the baking pan when cooking or place it on the lower slot when toasting to protect the heating elements from dripping juices or falling crumbs. What really surprised is just how despite using one half the electricity of a standard oven, it cooked food twice as fast. It also pre-heats at least twice as fast, too! I’ll go into more detail about those advantages below. In order to use the oven properly you’ll need to read the included quick start guide and owner’s manual. Following the instructions included (using the convenient diagrams that make it very simple) I moved the oven racks as needed depending upon the features in use. To use the toaster oven, you’ll need to set up the cooking trays (included) in the correct position as recommended. For nearly all cases I used position #2 (the top slot). The Cuisinart TOA-60 is unique in that it includes an extra second bottom slot (#1) which allows cooking large items like a whole chicken. I think it’s a smart design. The power light is on while the oven is in use (cooking). A push button light switch turns the interior light on or off. 4 dials make up the controls for operation: 1) Cooking timer, 2) Temperature dial, 3) Cooking mode, and 4) a 3-level toast darkness selector (which is a timer, too). The oven features 4 main dials which I found very easy to use and of high quality as well. All dials had a good “feel” to them during testing. I should also add that unlike some other toaster ovens, you can switch the oven timer off if food is done before your set time. Some ovens, for some reason, won’t allow turn the timer of Off and you have to let the timer run out in that case. 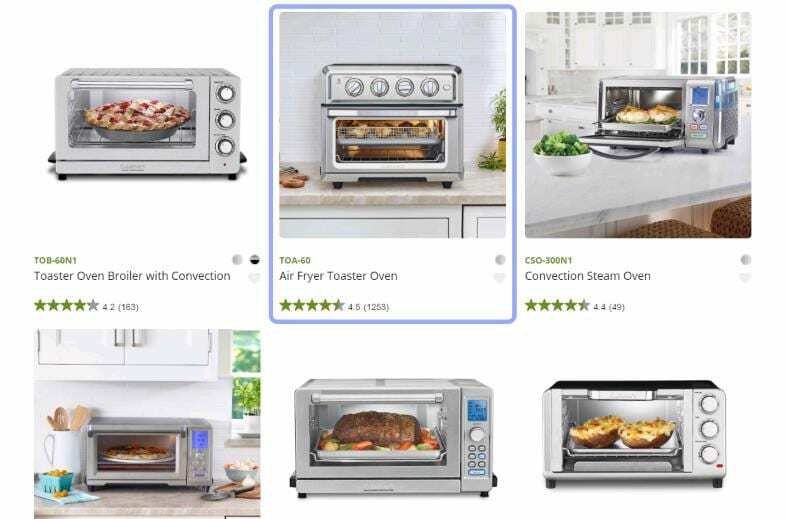 There are actually 7 functions to select in total as Broil and Bake offer convection cooking modes, indicated by a small fan symbol on the dial label. Toast mode is a bit different. To toast items, set the function to Toast, then choose a darkness level. Turning the toast darkness dial engages a timer which will automatically turn off the oven when done, just like the 0-60 minute timer, but with a preset time used for convenience and perfect toasting every time. Warm mode puts uses fixed temperature which I measured as about 161 degrees, perfect for warming up leftovers or keeping your meal fresh and hot. I really wanted to see how much of an advantage (or disadvantage) the TOA-60 had to offer over my traditional large home oven. 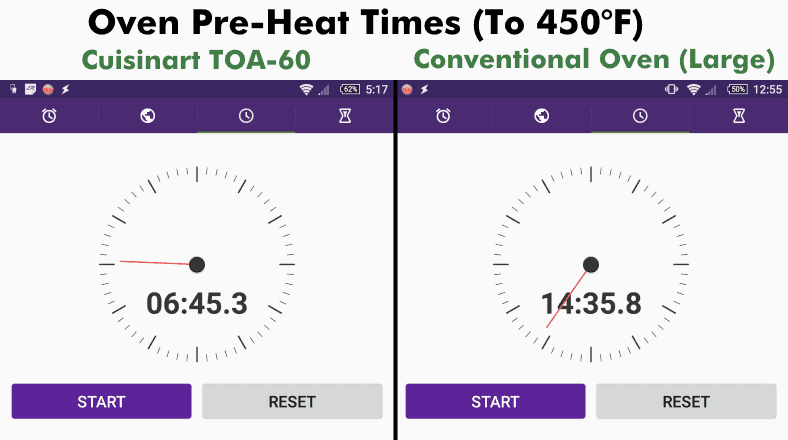 In order to do so, I measured pre-heat times to 450 degrees using a precise digital high-heat thermometer and stopwatch app on my phone. The results were really surprising! Measuring the warm-up (pre-heat) times for a large conventional oven to compare to the Cuisinart toaster oven. In both cases I used an accurate K-type thermocouple high-temperature probe with a digital thermometer, then recorder times to 450°F and recorded what I found. I set up my an accurate, high-heat temperature probe and digital thermometer to measure the time it took to pre-heat the ovens to 450 degree Fahrenheit. This is the time you’d typically have to wait before beginning to cook your food. Carefully setting up the temperature probe for measuring how long it takes the Cuisinart to warm up to “ready to cook” temperature. I used 450 degrees as the measurement, as it’s a typical setting for many cooking tasks. For those of us who hate to wait to eat, that’s a big deal. Both Cuisinart and other oven manufacturers recommend pre-heating your oven for ideal results and cooking preparation. First I measured my conventional (large-capacity, high power) oven and then the Cuisinart TOS-60, recording the data and measurements. 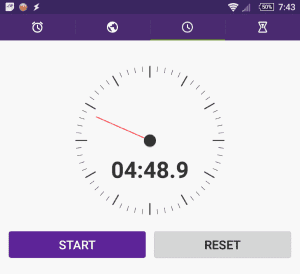 As you can see, the Cuisinart took less than half the time it takes a full-size oven – less than 7 mins vs over 14 minutes. I have to say, despite being smaller and much less expensive than my full-sized oven, I’m definitely impressed. Once again, the Cuisinart wins here for many people, as you’ll use about 1/2 or even less power than a traditional oven. 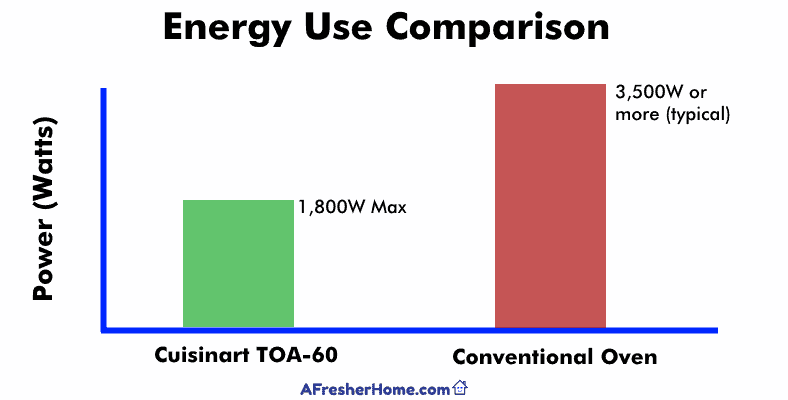 Many regular-sized conventional ovens use about 3,500W watts, if not more! When using a larger oven, a lot of energy you’re paying for is simply wasted. If you’re only cooking small meals and not larger than normal amounts of food, it’s unnecessary. Not only that, but don’t forget that it takes longer for a big oven (as I proved earlier) to warm up. So it’s not just money you’re wasting with a bigger traditional oven, but time also. 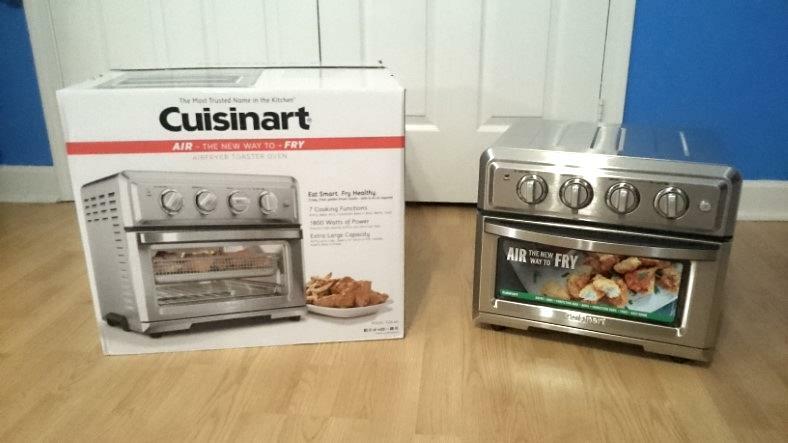 Comparing the Cuisinart to a conventional oven really made me begin to appreciate just how much of a great value it is. Not only that, but it simply improves my quality of life by wasting less time and money, too. One of the buyer complaints I’ve seen is that the actual temperature may be different from what the oven is set to. 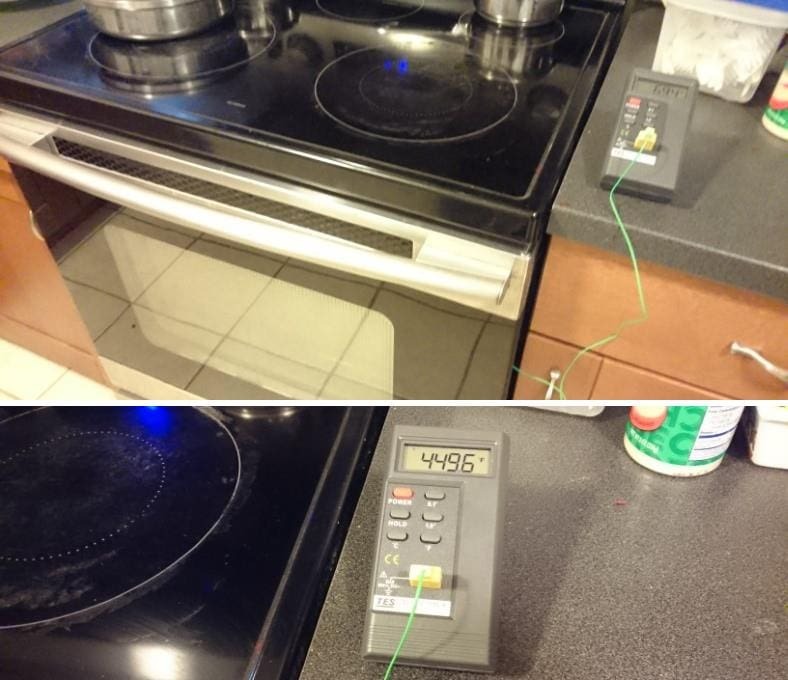 In order to find out more I measured the oven temperatures when set to 450° to check how it actually behaved. I measured a minimum of about 390 and a maximum of about 470 degrees. While that may sound like a bad range, in fact in practice it’s both normal and acceptable. The reason is that the Cuisinart, like most toaster ovens in its price range, uses electro-mechanical controls to maintain the cooking temperature. This means you won’t get more precise oven temps as they’re not able to behave the same way as more expensive, and complicated, products. In my testing experience the temperature range was about right and worked fine. I don’t believe its any cause for concern and isn’t really an issue. I used the toast function for each setting and recorded the times. This way I could be sure of how long you’ll have to wait for your toast, as in my experience, cheaper pop-up electric toaster are not consistent. However, I’m happy to report the Cuisinart’s mechanical timer was very consistent and you’ll get consistent, reliable toast results every time. For nearly all of my life, despite loving delicious toasted bread, every single electric toaster I’ve owned was really disappointing. Electric toasters are known for being flaky and not consistently producing good results. Quality toaster ovens I’ve researched have a great reputation for fantastic, delicious toast that many owners enjoy. I decided it was time to prove what the TOA-60 can do. 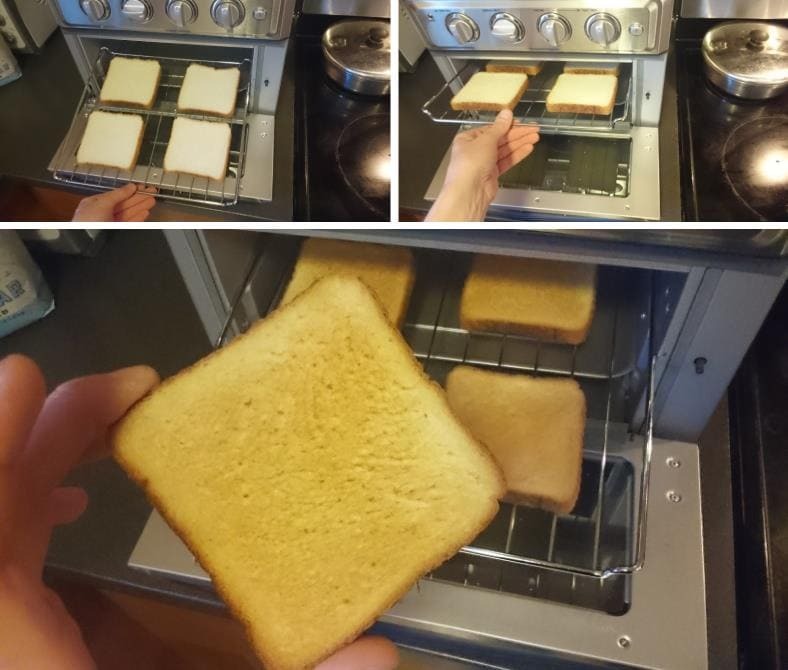 In order to test its toasting performance, I used 4 slices of fresh white bread (although it can hold 6 slices) and set the toast level timer to Medium. I took the toast out when the timer was done – and heard that wonderful “ding” sound. The results were delicious. To check the bread toasting function, I used 4 slices of white bread on the oven rack. Note that the TOA-60 can actually hold 6 slices, by the way. I used the oven rack (in slot #2, the top position, as directed by the manual) and the baking/crumb tray in position #1 to catch the bread crumbs that fall. Next I set the Toast setting to Medium and waited for the timer to end, chime the bell, and turn the oven off. Then I took out the toast. Honestly, I was very happy with the results. Honestly, this was some of the best toast I’ve ever eaten in my life. Without a doubt, it’s the best toast I’ve ever eaten! The bread was a perfect medium darkness, and crisp and delicious. I can’t believe I wasted so much time, stress, and money on lousy electric pop-up toasters in the past. Toaster ovens are often especially useful for baking a variety of foods and they’re perfect for personal sized pizzas. Convection baking uses fans to circulate the hot cooking air in the oven and more evenly distribute the air over the surface. It provides more even cooking for many types of food and is recommended for pizzas and other foods with a crust for best results. Note: When using the convection baking mode, it’s recommended to reduce the temperature by about 25 degrees. To cook them all, I set pre-heated the oven to about 425°F (as recommended) with the mode set to convection bake. I used the top rack slot (#2) as advised also. I had to be sure to watch the pizza to keep it from burning! 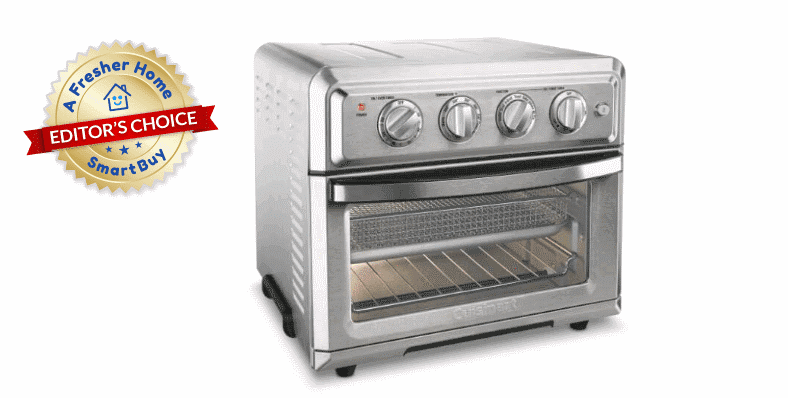 This little oven is quite powerful for its size and the pizza was hot and ready in less than 5 minutes. To check how well it was cooked, I measured the internal temperature to make sure it reached 165° as recommended on the package. Before I knew it the pizza was ready! Honestly, I’m not accustomed to cooking a frozen pizza. I’m impressed. To verify the cooking, I measured the internal temperature with a digital thermometer to make sure it reached at least 165° as directed. 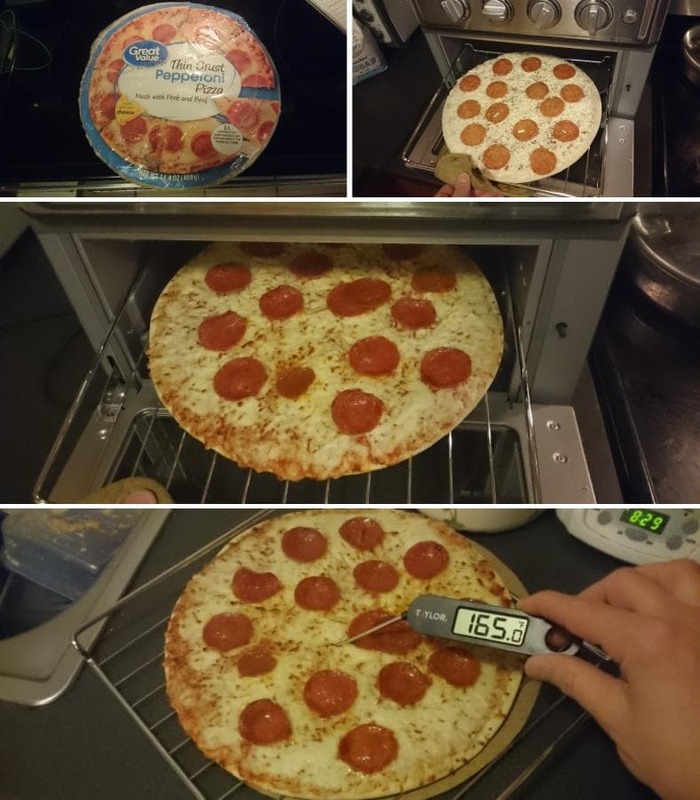 I measured the time it took to cook a perfect frozen pizza, with excellent inside temperature and a crispy crust. In less than 5 minutes I got great results. I won’t lie to you – I bought inexpensive test pizzas (about $2.24 each) and expected results. However, honestly the taste was better than I expected. The pizza crust was crunchy and evenly toasted. The cheese and pepperoni were well-cooked and tasted great. If you’re a pizza lover and want that delicious, crunchy restaurant-style taste, it’s an excellent choice. It’s like a home version of buying a pizza at a dine-in restaurant. Making your own fresh, crisp pizza is also a wonderful feeling. The Cuisinart made it easy and fun for me to do. I cooked 2 Hot Pockets containing cheese and pepperoni. They took longer to cook (as expected) as they’re frozen foods that have to be thawed and cooked internally. This takes more time than thin foods. The results were excellent. 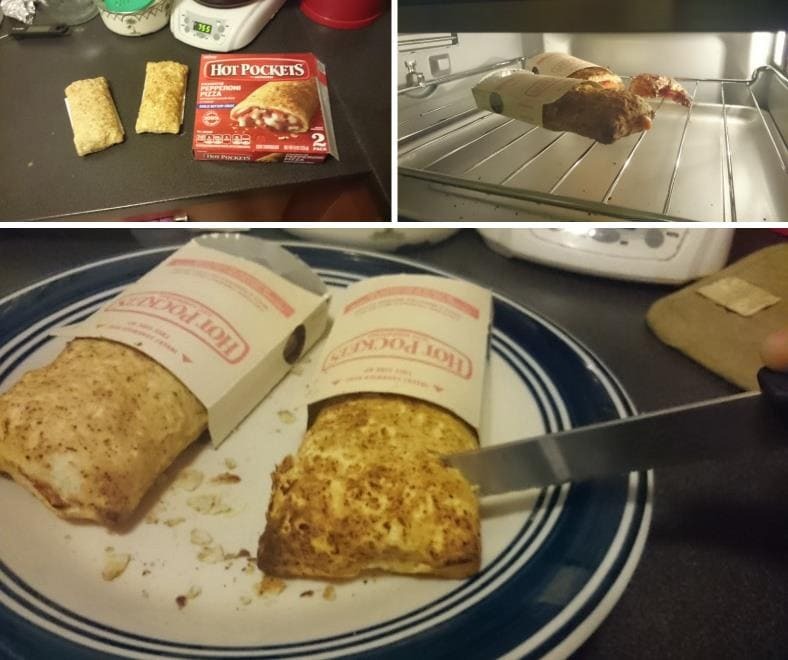 Similarly, I cooked a small pack (2 units) of pizza Hot Pockets which are bread-wrapped cheese and meat foods that make a great snack or easy meal. As they’re frozen and contain food on the inside, I knew they’d take longer to cook. Again, using the convection bake feature set to about 425° and pre-heated I carefully cooked them while checking the crust. They did take longer to cook than the pizza (as expected, as the internal temperature takes more time to rise) but were still pretty quick. After about only 6 minutes they were ready. Checking the internal temperature and crust, I found the outer crust to be very well toasted – and deliciously crunchy! A microwave simply can’t do justice to this kind of food. Caution! The outside of the oven gets very hot while in use so you’ll need to be careful. Never place heat-sensitive objects on top while it’s in use or allow children to be around it to avoid burns. I was able to cook an entire family sized bag of Tyson chicken nuggets all at one time in the baking tray. To help keep things more neat, I covered the oven rack with foil before cooking (although you can use the baking tray instead). The nuggets turned out crisp, fresh, and great as well. 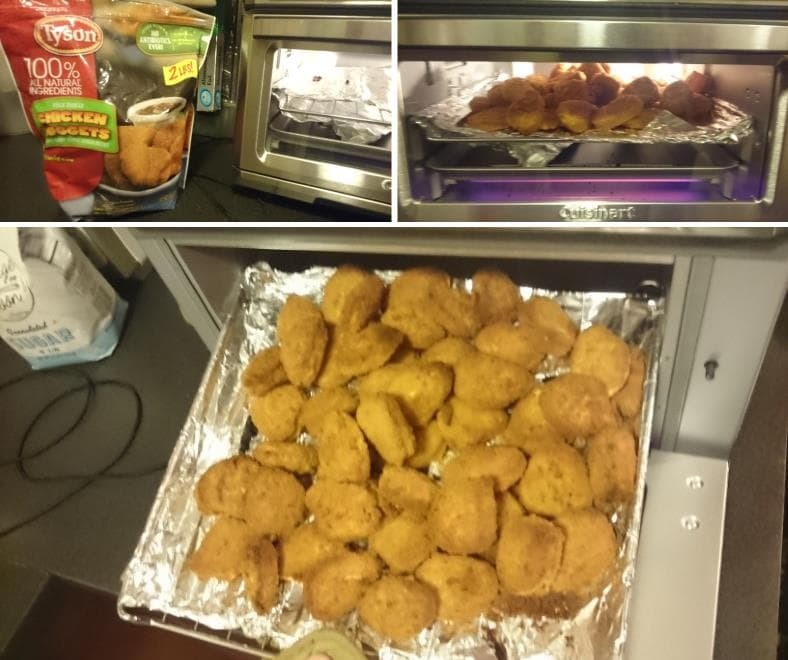 One thing I like, and that you can’t do with other toaster ovens, is that I was able to cook an entire large bag of chicken nuggets all at once. I set the cooking time to 10 minutes and waited for the bell, telling me my food was ready to check. Ding! And just like that they’re ready. The TOA-60 is powerful enough to handle them all and cook them evenly with ease. They were fresh and hot with a crunchy toasted outer breading. I’m not a chicken nugget fan myself but I know a lot of you out there are (especially those of you with families). Once again the oven test passed very well and as long as I gave enough cooking time the results were excellent. Let me be honest: this is my first air fryer I’ve ever tested! According to friends, they’re great appliances to have, and they absolutely love theirs. I was really wondering what the hype was about, so I did my homework beforehand and made sure I used the Cuisinart to its greatest potential. Sure, you could spend more money and get a separate air fryer but why would you do that when it’s built-in here? Following both the quick start guide and owner’s manual, I used Cuisinart’s recommendations for getting optimal results from the air fryer mode. While air frying is a substitute for deep-frying and saturating food in oil or grease, the ideal method is to brush or spray a light coat of cooking oil on the surface of the food before cooking. To test the air fryer with both wings and fries, I placed the food in the fryer basket, placed on the drip tray, and then applied a light coating of canola oil. Note that other types of oils can be sprayed or brushed as well. I set the timer for about 12 minutes and checked periodically. The wings came out great! Crisp and fresh, rivaling restaurant wings I often eat. I’m a big chicken wing fan and often dine out locally, enjoying delicious “original” fried dry rub or sauce-coated favorite flavors. The problem with wings, however, is they money you’ll spend – as well as having to drive to the restaurant or pay for delivery. 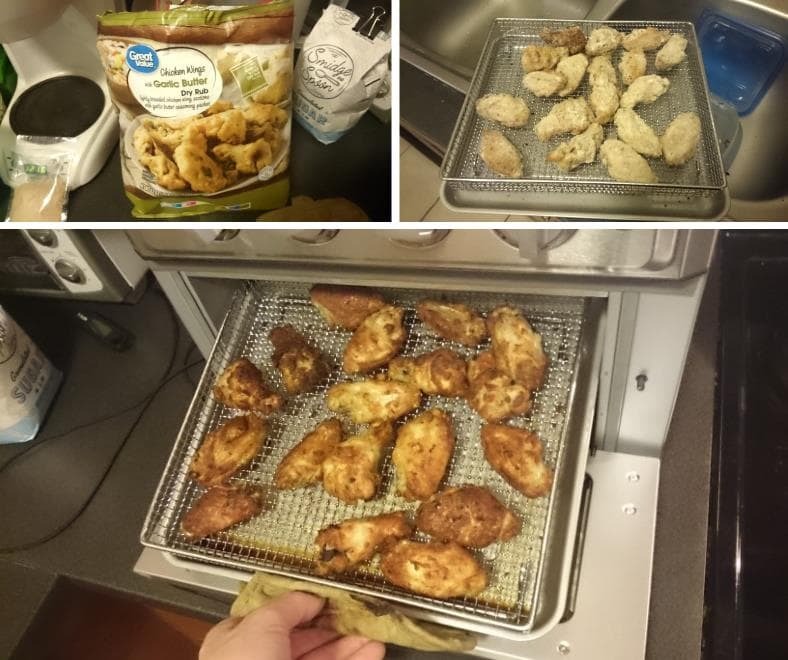 Having been very curious what air fryers are all about, I just had to see if I could cook my own at home. 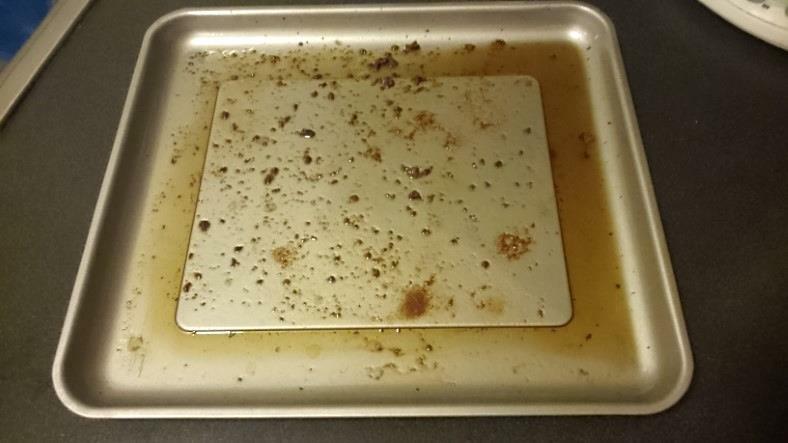 When using the air fryer and cooking some meats or other foods the baking pan serves as a drip tray. After cooking oils and fats within the food may be released. It’s a huge change from the dripping oils from fried food! Clean up was pretty easy. However I recommend lining the pan with aluminum foil for easier use. I coated the wings lightly with a healthy canola oil before cooking them in air fryer mode with the timer set to 12 minutes (although it turned out it takes a bit less time, in fact). I allowed the wings to darken to a crisp and after allowing them to cool I tasted them. The result was crunchy, well-cooked wings that reminded me very much of restaurant-fried original wings. What’s interesting is there wasn’t any “strange” flavor – I didn’t miss the fried taste at all. In fact, I kind of like how they’re different and far healthier as they’re not soaked in frying oil or shortening. I picked up a large bag of crinkle-cut french fries to try, too. I’m not a fried food fan, so using the air fryer makes new things possible as it’s so darn healthy, yet gives great results. 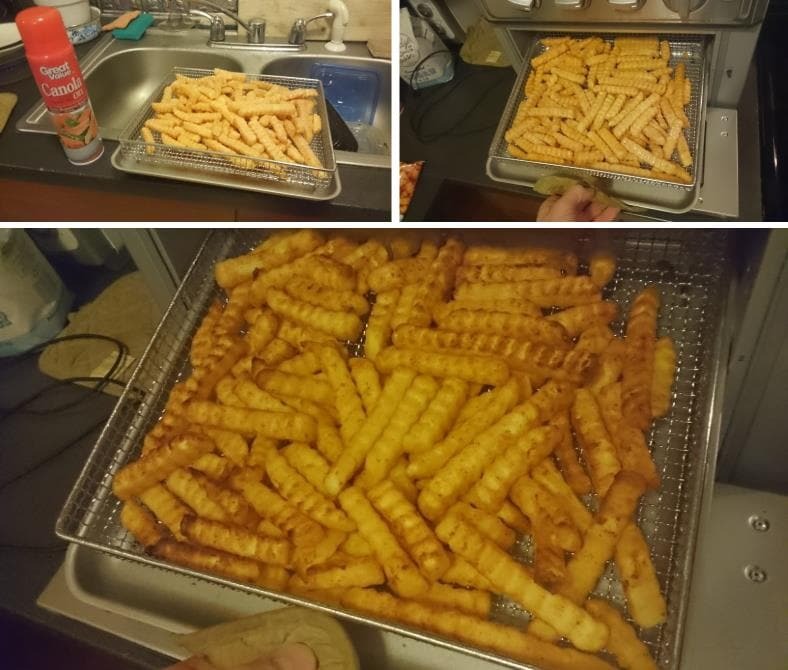 I cooked a basket full of fries (I did need to shake and turn them a bit while cooking). The fries were crunchy, crispy, and amazingly delicious! Not only that, but there was not terrible cooking oil dripping everywhere when they were done. Similar to how I cooked the wings I was able to fit an entire large bag of crinkle cut french fries into the basket. After applying a moderate amount of spray oil I set the timer to 15 minutes and periodically checked on them. When they started to crisp a bit I removed the basket and stirred them to check for any uncooked french fries. After just a few more minutes they were done. The french fries were nice and toasted, had a lovely golden brown color, and were amazingly crispy. If you’ve ever wondered how french fries are supposed to taste, this is it! Ordinarily I don’t eat french fries because of how terrible local restaurants are with their fried foods: dirty, stinky fryer shortening is used over and over and and it food a strange taste I hate. Used fryer oil wreaks of an odor I can’t seem to forget and I hate it. However, for once, I really enjoyed the french fries I ate. Guilt-free, fresh, healthy, and most of all, they were mine that I cooked myself! The oven features 2 broil modes: (standard) broil and convection broil. Convection broil uses fans to distribute the heated air more efficiently for enhanced cooking. I tested the convection broil feature using frozen tilapia fish filets. The timer was set to 15 minutes and I made sure to check the cooking progress as time went by. The fish was done soon and was quite nice! Fresh, hot, and thoroughly cooked. Using the broil feature, like convection baking, is just as simple. I used the baking with a light cooking oil spray to avoid sticking and cooked 8 tilapia fish filets. The mode dial was set to convection broil (indicated by a small fan symbol next to the name) and the cooking timer set to 15 minutes. What I found was great – the fish was well-cooked and is some of the best I’ve had. While in the past I attempted to use my standard (large) oven it was always a time-consuming process because of the long times required. Once again, the cooking test results were great and the oven impressed me with the broiler function, too. As not everyone will know how to use it right away. 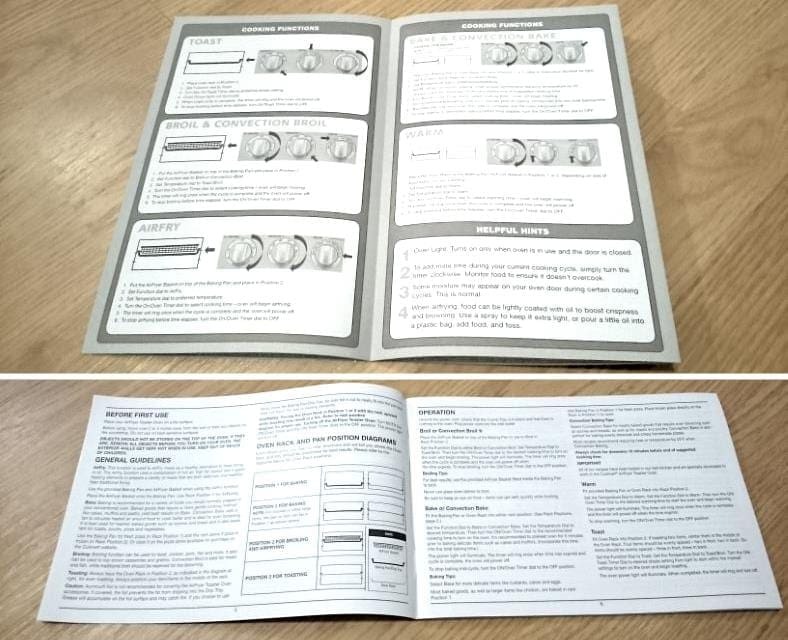 and especially to get the most out of it, you’ll definitely want to read the quick start guide included in the box. I always like to check the instruction manual included with a product to make sure it’s clear, helpful, and will give enough information. Top: The quick start guide is a short pamphlet that shows the basics for setup and operation of the toaster oven. Bottom: The owner’s manual is clear, helpful, and goes into a bit more detail of the various cooking functions. It also includes any warnings (like how the outside gets hot) and best practices. I really like that it includes some great recipes as well. 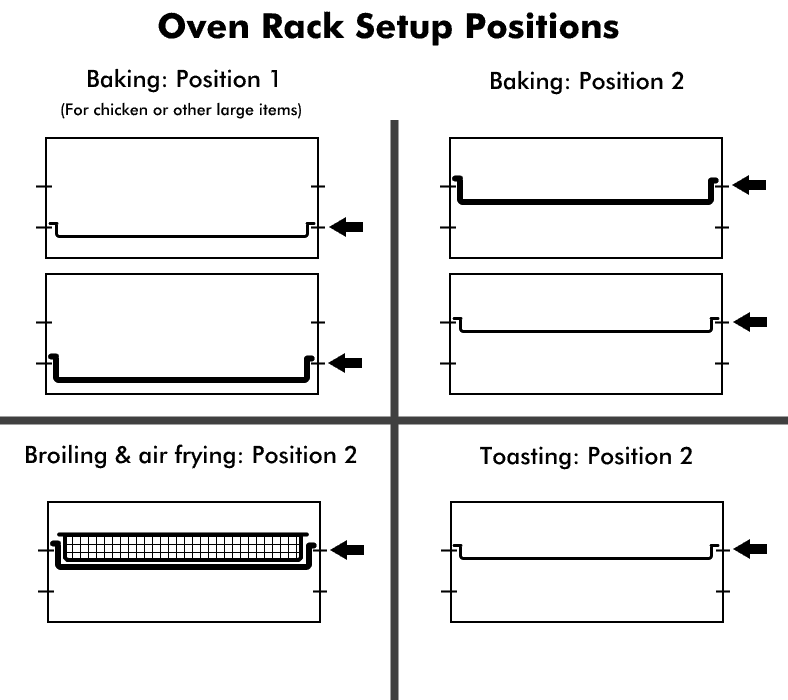 Checking the quick start guide included, I found it easy to setup the oven racks for cooking right away. The instructions also told me nearly all I needed to know for getting started quickly. Likewise, the owner’s manual is really good, too. However, it goes into more detail especially about the various cooking functions and how they work. Additionally there’s warning, cleaning, and cooking tips to know. 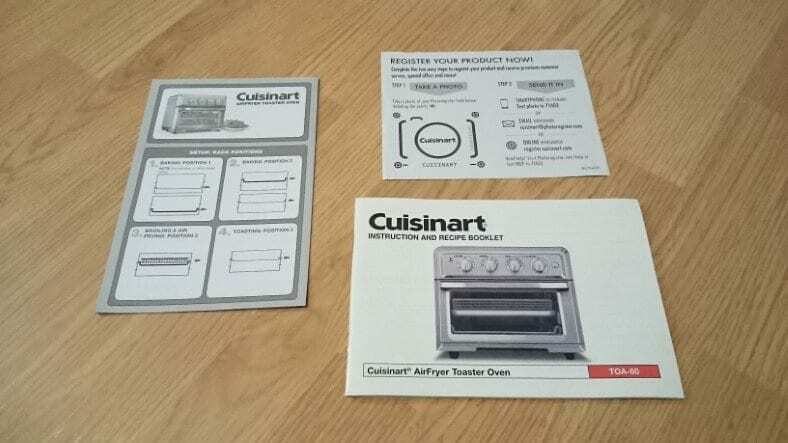 One more pleasant addition: Cuisinart provides some great toaster oven recipes in the manual as well. It’s a nice touch I appreciate. The manufacturer provides a 3-year warranty which is pretty darn good, considering most are normally 1 year. The included registration card made registration really easy. That’s pretty cool and really avoids any headaches in my opinion. Here’s my honest opinion: I’ve tested a lot of products in my time, but few have improved my quality of life the way the Cuisinart TOA-60 has. While I do have a few complaints (see the review summary for details), and I prefer a nice digital display, in testing the TOA-60 I found it to be a great performer, very easy to use, and I got excellent results. The meals I prepared were just as good as take-out food and were much less expensive, too! I loved it so much I’ve awarded it my Editor’s Choice award for being a solid value. Based on my test results – and the great-tasting food it made – the Cuisinart TOA-60 is a fantastic choice for affordable, healthy, and delicious food. If you love good food, you’ll love the Cuisinart TOA-60. Be sure to head over and check out the amazing buyer reviews and current low price at Amazon. A great toaster oven and excellent air fryer too, the TOA-60 cooks delicious and crispy food you'll love. Don't pass this one up. The Cuisinart TOA-60 is a popular toaster oven that cooks healthy and FANTASTIC-tasting air fried, baked, toasted, and broiled food. Despite cooking food twice as fast and with 1/2 the power of traditional ovens, the results of my tests were nothing short of wonderful. It's well-built, easy to use, and the Cuisinart allowed me to enjoy some of the best food I've ever eaten at home! I can't recommend it enough. Just don't touch the outside while cooking (it's hot enough to burn your hand) and allow it to pre-heat before using for best results. While digital controls would have been nice, in real-world use I never missed them. It's definitely one of the best for your money. Honeywell HPA060 Review - Is It A Good Buy? I didn’t find a lot of difference between bake and convection bake, did you? The fan comes on during the regular bake cycle – and I wondered if you noticed that as well. Breads seem to get burned before the middle is completely done. Convection baking uses a fan at all times while working, while standard baking does not. The reason you may hear a fan turn on while in standard baking mode is because the oven temporarily runs a fan to maintain the cooking temperature you set. I observed this when first testing the oven’s preheating time. Not having cooked bread yet, I haven’t had the experience of burning it, but it sounds like you should be using convection baking if you’re not already. That, from what I’ve seen with the oven, should help. Also I am very careful to check the cooking progress as the oven is a bit faster cooking then I originally expected. Once I note cooking time I can then just use the timer and not worry as much about burning. Your display for cooking chicken nuggets, you used aluminum foil over the wire rack. I read in the opening instructions of my manual to never us aluminum foil. 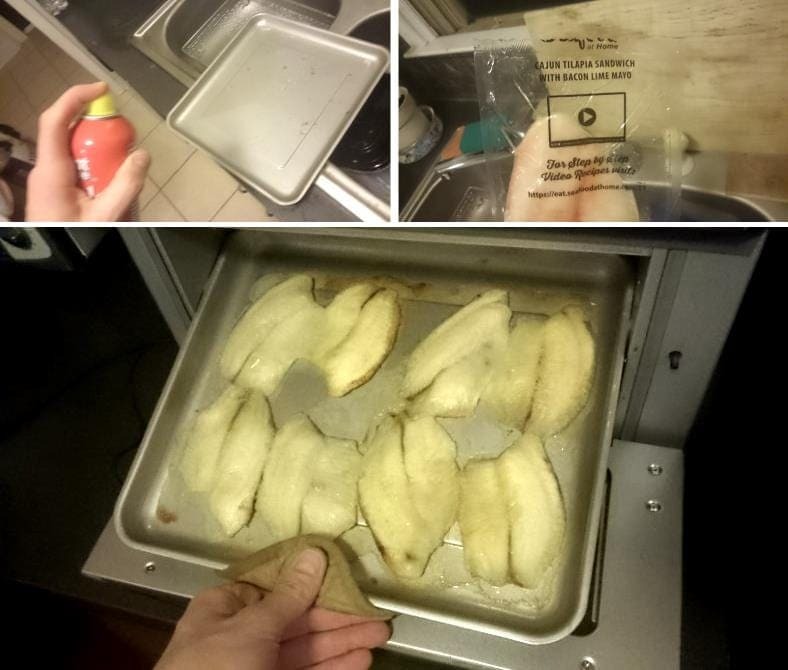 My initial question when coming to the computer was: Can I use aluminum foil w/the shiny side down on the bake and drip tray to help me keep unit clean as I have done w/my Cuisinart toaster oven. You seem to have contradict the recommendation. Can you help me out here? Lastly, it seems I get confused between the function of “bake” and “the symbol in front of bake’. The 1st is bake, the 2nd convection. Are either functions taking less time? How do i know when the preheating temp hs been reached? Am I missing something? Hi Carole. It’s pretty simple, actually. Just set it to the cooking mode you’ll be using (like convection bake) and then set the cooking timer to roughly 6 mins and you should be good. When the chime goes off it should be ready and warmed up to the right temperature. Hi Sandy. I can see why you would think they meant aluminum foil products are not to be used, but they meant no aluminum packages for food. They should have been more clear about that and the note about no utensils as the reason why is in case they might fall or get bumped around and could end up on top of the heating elements. Also they might be assuming that some people would use an aluminum container entirely rather than using it on top of the baking rack as intended. You know how some people will do crazy things! You can definitely use aluminum foil to help keep it clean. I had to wrap mine tightly so it would slide in properly, but it wasn’t hard. You also need to make sure there aren’t long stretches of foil hanging down to touch the heating elements. Bake (no fan symbol) is the standard oven baking, no fan circulating air. With convection bake (fan symbol) a fan is used to circulate air while baking for more even toasting and better heat distribution. It also tends to be more effecient at cooking and you may need to turn the heat down a bit. Most people recommend reducing the temperature by 25 degrees when using convection baking. It does also seem to take a bit less time from my personal experience, since the food gets heated better. I hope this helps, and thanks for stopping by! Can I trim a silicone baking mat to fit on the baking tray for oven use? Hello, Helen. Yes, you can trim an oven-safe silicone baking mat for the baking tray. Before buying a silicone mat I would check reviews if possible to see how buyers’ mats held up.